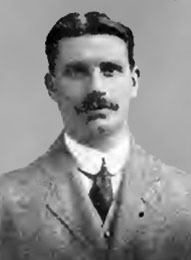 Jack Mackie, from Elie, was the brother of Isaac Mackie but went to the United States two years earlier than his brother in 1899. His first assignment was to lay out the course, and be the first professional, at Roseville, NJ before moving to Yountakah in the same state in 1906. A spell at Dinwoodie in New York followed until 1916 at which time he took up his longest appointment, at Inwood, where he remained until 1948. Inwood was where Bobby Jones won his first major, the 1923 US Open, but it was Jack Mackie’s instant architecture at the USPGA in 1921 which springs to mind when Inwood is mentioned, Walter Hagen had found a strategy to play the 17th by driving up the parallel fairway on the 18th. The evening before the championship began Mackie and a greenkeeper dug up a fifteen foot weeping willow in the woods by the 16th fairway and replanted it to divide the fairways. On arriving at the tee Hagen remarked that he had never seen such fast-growing trees. Two minutes later the wind caught the supporting wires and the tree fell leaving the 18th fairway open to Hagen. A founder member of the USPGA, Jack Mackie was elected its second president in 1916 and from 1927 until 1939 he was treasurer. He died in January 1953 aged 74.